✓ Retain and enhance the what makes Port Moody amazing, as we grow from 33,551 to 50,000 residents. The last four years have revolved around deciding how to grow of our city, making decisions that now have our projected population escalating above and beyond the city's growth targets that we all agreed to in 2014's "Skytrain Revision" of our Official Community Plan (OCP). This is not fair to our existing residents, and I stand with the countless folks and families who have stood up this term and told us loud and clear that growth should never come at the cost of quality of life. Most important to note, it is not too late for course correction: The vast majority of these envisioned population increases have been amendments to Port Moody's vision document - the Official Community Plan. Without re-zonings or development permits issued for these mega-projects yet, new leadership at City Hall has the ability to bring our city's vision back on track with our growth targets and add the necessary provisions (congestion management, park space creation, etc) that will keep our quality of life second-to-none in the region. do not increase growth targets during this revision! No one is saying "don't build", certainly not me. Our community's housing needs are changing, some parts of town are in desperate need of a facelift, and we definitely need more affordable housing and some densification of Port Moody's transit-connected core. But when driving a car, you don't just push the accelerator to the floor board for the entire trip, and the same is true for setting the pace of development - somewhere between 0 and 100 there's a sweet spot. The growth we accept has to make the community better. According to the City's own Growth and Development fact sheet developed specifically to dispel myths and misinformation surrounding development, we are currently overshooting our 2040 growth targets, set out Official Community Plan (OCP). This "green-lit" growth includes units approved, as well as population estimates for amendments to Port Moody's city planning vision added by the current leadership at City Hall. In short: Port Moody is already at least 22% over our Official Community Plan's 2041 growth targets. Remember…we have 22 years to go. can we handle peak traffic getting 40% worse? Image Source: City of Port Moody, labels added for clarity. Image references a draft land use plan that reflects a scenario that is possible with the amendment added to the OCP. This land use plan was taken by the City to Metro Vancouver for inclusion in their Regional Growth Strategy to advocate for inclusion, which was carried by Metro Vancouver. "We're getting a development...much like False Creek or Coal Harbour in Vancouver"
We don't stand on our current trails, wishing someone had built towers there in the past...the breathtaking nature that was preserved keep us busy instead. City Councils of the past had the foresight and the VISION to wrap our inlet in meaningful public parkspace - not tiny strips of land that will feel like the backyards to the multi-million-dollar condos towering up to 38 storeys above, or the luxury townhomes wasting precious waterfront land. Now it's our turn to carry that torch by toning this project down a notch, and expanding Rocky Point Park as a matter of principle. 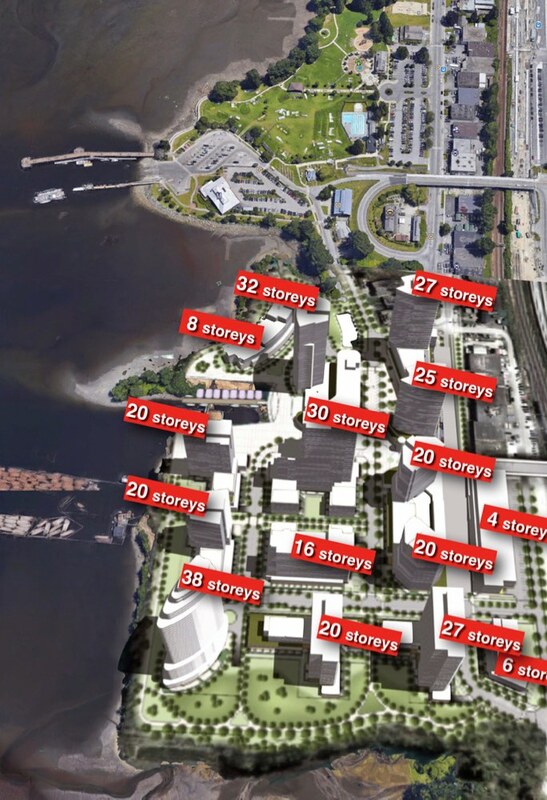 And to be clear - no one is saying 'No Building', no one is saying Oceanfront shouldn't be built. What we need for this site is balance, common sense, and park expansion. where will traffic from new cars go? Image displays a Build Scenario that reflects a scenario that is possible with the amendment added to the OCP. This Build Scenario was used by the City in public consultation sessions about OCP changes to the Moody Centre TOD area, which were approved by Council. I am excited for Port Moody's growth, I love the SkyTrain, and Moody Centre is in desperate need of a facelift. That does not mean we need to accept everything that builders ask for, and it does not justify turning our backs on previous agreements with the community, such as growth targets and tower height restrictions. Community agreement on such topics took years to achieve and must be respected moving forward, with similar timeframes for the public to provide their input. With its proximity to SkyTrain, Moody Centre is perfectly positioned to become the Economic Engine of Port Moody. Rather than focussing on how many residential units we can cram into these four blocks, we should be looking towards innovative, purpose-built jobs space, with a modest amount of residential growth. With high-speed fibre Internet connectivity now laid under this part of town, we have a once in a lifetime opportunity to partner with industry - whether that's post secondary education, tech, or anything in between - and custom-build a neighbourhood around their needs. These provisions must be added into the Official Community Plan, as Re-Zoning and Development Permit are very late stages of the development process. Strategic planning starts at the OCP level, and that's where these provisions belong. This would achieve maximum benefit to our residents, create well-paying local jobs, and tone down the residential component of the re-development of Moody Centre to fit within our growth targets. Murray Street is a unique part of town, that features some of the most affordable industrial zoning. These affordable conditions are the biggest reason that Brewers Row exists today, and having residential condos added into the mix threatens to tip this delicate balance. A walkable promenade would draw locals and tourists to our craft breweries, local restaurants, artist spaces, performance venues, and buzzing street life. This fun, exciting heart of the City of the Arts builds upon the momentum of our local breweries to completely re-energize the area! Ensuring that the delicate market conditions that first spurred Brewer’s Row aren't thrown out of balance will be our greatest challenge, and a long-term vision for the arts and entertainment economy would be our amazing payoff. Being close to transit, some residential units would be appropriate directly beside the Skytrain station given appropriate transportation connections. However, the true potential of Murray Street lies in seizing the opportunity given to us by Brewer’s Row, and further incubating an Arts and Entertainment District for Port Moody to enjoy for generations to come. PROJECT ADDED TO PLAN BY CURRENT LEADERSHIP. Image references a draft land use plan that reflects a scenario that is possible with the amendment added to the OCP. This amendment to the Official Community Plan was the one originally fraught with the most controversy, but has since become the poster child for near-consensus. Originally, the neighbourhood came out divided almost exactly 50/50: About half of residents preferred small scale redevelopment, with the other half opting for high density. Over time, this gap narrowed and now there is near-consensus for high density in the neighbourhood, a fact that actually changed my mind about the project. Now, quality-of-life provisions must be added into the project to maintain the same Port Moody Standard we have all come to enjoy, love, and take as a given. A larger park space allocation is crucial, spaces for community centres must be reserved, and access/egress points must be added into the plan. These provisions must be added into the Official Community Plan, as Re-Zoning and Development Permit are very late stages of the development process. Strategic planning starts at the OCP level, and that's where these provisions belong. Due to lack of city-wide controversy surrounding this neighbourhood plan, Coronation Park deserves to be prioritized through the upcoming 2019 OCP process so as to alleviate anxiety in the neighbourhood, and allow re-development to begin as soon as possible. In this day in age, it's completely out of the question to be discussing splitting our parks in half with clearcutting for roads, or giving builders a free-pass on parkland acquisition because it may delay their projects. When it comes to our quality of life, Port Moody residents have consistently mentioned their access to world-class outdoor recreation, and that's not something we should be willing to compromise on. a City-commissioned engineering study has confirmed what many had suspected - that about half of the new car traffic would still take Ioco Road even if a park road was built. "The very politicians who responded to my message in the 90’s are proving that they really didn’t get it after all"
"Putting a road through Bert Flinn would be like driving a stake through its heart." Since its inception in 1999, Bert Flinn Park has been one of the most significant pieces of parkland in Port Moody’s history. 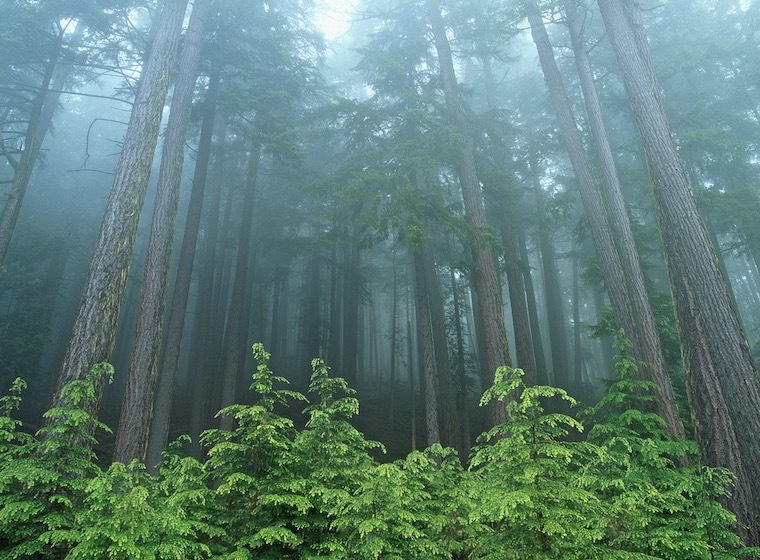 It is Port Moody’s largest park, and one of the few nature parks in the City—a significant factor to consider when comparing it to other parks. Created by way of a city-wide referendum where residents overwhelmingly voted against developing the land into suburban development and instead chose conservation and recreation, the park has since become a favourite for families, dog walkers, runners, hikers, mountain bikers, nature lovers, and those wishing to escape the hustle-and-bustle of city life. At the time, municipalities did not have the jurisdiction to remove or change road Right of Ways like the one originally planned to service the neighbourhoods that were never built. As such, the route stayed on the map and was given a new purpose by the city almost a decade later: it would now feed commuters to a potential new development on the far side of the Park - the Ioco Lands. As the possibility of car-dependent development at these far flung properties revved up, concerns and doubts regarding the scheme began to be aired by residents, including its impact on natural and recreation areas, as well as its effectiveness at addressing the transportation issues it seeks to solve. These residents have organized around a petition to Save Bert Flinn Park, which has since received over a thousand Port Moody signatures. Times have changed; what was once accepted in the 1980s is no longer considered a reasonable option. On paper, the strip of land in question is officially designated as a road, not parkland. The real-world use of the land by the community, however, has evolved since the 1980’s into one of recreation. The gravel strip has become an essential recreation component of the park. Correcting the discrepancy between the “on-paper” use and the “real world” use of this land is the driving force behind the movement to unify the park, as frustration over the discrepancy between the community’s view, and that of the City is felt by many of the petition’s signatories. It is beyond doubt that cutting our largest park in half with a road would change it for the worse. While some have argued that this road would alleviate Ioco Road traffic resulting from a potential development at the Ioco Lands, a City-commissioned engineering study has confirmed what many had suspected - that about half of the new car traffic would still take Ioco Road, even if a road is built through the park. By supporting higher-density development at the Ioco Lands, a road through Bert Flinn Park would not only ruin the park, but also ruin the very road its intended to assist. This does not even consider the devastating impacts of any future land sale from the Imperial Oil Lands. Rather than ruining our largest park, these issues are best addressed by a Comprehensive Ioco Corridor Strategy that says no to adding density at the Ioco Lands, limiting thru traffic along Ioco Road by removing it from Translink's Major Road Network, instead focussing on safety and serving the needs of its neighbourhoods. From there, if Anmore wants to develop its share of the Ioco Lands, it shouldn't be up to Port Moody residents to subsidize this growth, either by ruining Bert Flinn Park, or overloading Ioco Road. This Council term, amidst one of the largest-ever citizen-led movements at City Hall, and the grassroots organization of thousands of Port Moody residents, our city’s current leadership voted against protecting Bert Flinn Park, claiming that cutting a road through our largest park may be a good idea down the line, and choosing to let the developer set the stage for discussions about this crucial park asset. Only a change of leadership at City Hall can bring this issue back, and make it known that clearcutting a road through our largest nature park is not acceptable. The developer, and Anmore, must work around our requirements of an intact nature park, and a traffic calmed Ioco Road to keep our quality of life amazing as Port Moody chooses more prudent projects to approve. "We're getting a development...much like False Creek or Coal Harbour in Vancouver, where they really celebrate their waterfront"
Yes, that Coal Harbour - the loud, always-congested, prohibitively expensive part of Vancouver's dense downtown core, featuring towers that go right up to this "celebration" of the waterfront: a thin, mostly-concrete strip that acts more like a backyard walking path for the multi-million-dollar luxury condos looming overhead. no thank you - we can do better. In times past, visionary municipal leaders took bold action when key times of opportunity arose, expanding the park in significant ways – such as the addition of the Shoreline Trail to Old Orchard Park. These park expansions were contiguous and deep - not simply small strips of publicly-accessible land. Such a key time of opportunity has come around again, with the potential Oceanfront Development on what is currently the Flavelle Mill site. Now that this project has been added to our Official Community Plan exactly as the proponent requested - even against the City's own Staff, who recommended toning the project down - the ball is now in our court to make the kind of decisions necessary to protect, enhance, and expand Rocky Point Park that will indeed be remembered for generations to come. 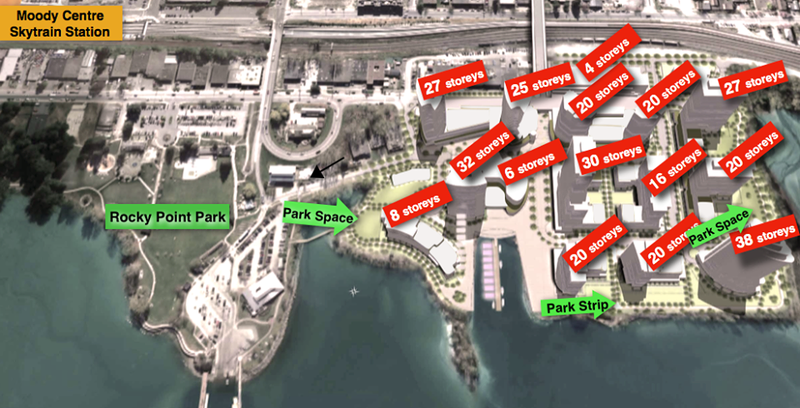 Rocky Point Park presents very few viable options for significant expansion. While the City currently has a policy to gradually acquire available property along the north side of Murray Street in the hopes of converting it to park space, this only results in small parcels being integrated into the Rocky Point Park system, one at a time. The maximum potential land augmentation from this approach would be inherently quite limited, and this process is extremely expensive. Implementing this policy would, at best, result in the addition of some scattered components being added to the Rocky Point Park system, rather than large new tracts that would substantially enhance the Rocky Point Park experience. It's time to follow through, and add this vision into our Official Community Plan to keep our quality of life amazing. Planning for the transportation and civic facility needs of our City's population is considered to be a basic job of any local government. With facilities, we in Port Moody lack the necessary long-term planning to replace our large-scale assets without significant financial impacts to residents - whether in the form of tax hikes or a push to sell some of the last-remaining City Owned Lands. We are all aware of the need for a new library, and have been told about this need for years, yet our current leadership has not planned for its replacement or expansion. Instead, we are being led towards bandaid solutions for these challenges, such as a one-time injection of cash by selling off some of the last remaining City-owned lands, or spending significant amounts of tax dollars on minor re-configuation within the library’s current, inadequate footprint. While I will respect the results of the referendum this election, I will be working towards modernizing our Capital Plan so as to avoid a situation so dire that pawning off an appreciating asset such as land - a practice avoided at all costs by modern municipalities - is being seriously considered as the way to fix the issue. On the transportation front, the City's Master Transportation Plan sets extremely ambitious assumptions about transit and cycling use, and predicts that we should be able to grow our city with no net increases to traffic volumes by 2041, largely because of the introduction of SkyTrain. While the Evergreen Line is great for folks who work along Skytrain’s limited routing, today’s reality is that the majority of our regional population cannot reasonably take transit to their place of work, or move their families to their various responsibilities by relying solely on transit. Rather than providing an excuse to justify ignoring the obvious traffic concerns of high-density residential development, transportation planning needs to address today’s reality first, then provide a plan for how to transition folks and families into a non-automotive lifestyle. "Ioco isn’t cottage country anymore"